To see all the Tishrei Holidays at UAlbany (Rosh Hashanah, Yom-Kippur, Sukkot and Simchat Torah), download our one-page PDF calendar at a glance: TishreiCard2018web.pdf or see our online Google calendar under Programs / Events Calendar. Most students head home for the Jewish New Year to spend it with family, but quite a few end up staying and joining us for prayers and meals. UAlbany now gives off for the first day of the holiday but not the second. Students observant of the holiday can contact Rabbi Mendel for a religious letter. No need for tickets, we don’t charge for services, and students can come for the portions that work for them. But RSVPs are helpful to us so we can be best prepared, see short form below. 5-6pm at Indian Quad Gazebo. Quick prayers, Shofar blasts, apple in honey, waterside Tashlich etc. More students tend to stay up for Yom-Kippur. We do a joint traditional student-friendly service both nights, and during the day split up between Orthodox and Reform. 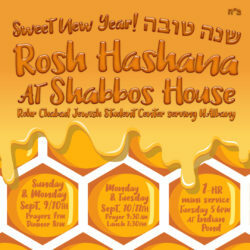 The pre-fast is at Shabbos House, the break-fast is by Hillel, and all the prayer services are held in the Campus Center. and then comes to joyous climax of the Tishrei holiday season, stay tuned for Sukkot and Simchat Torah!